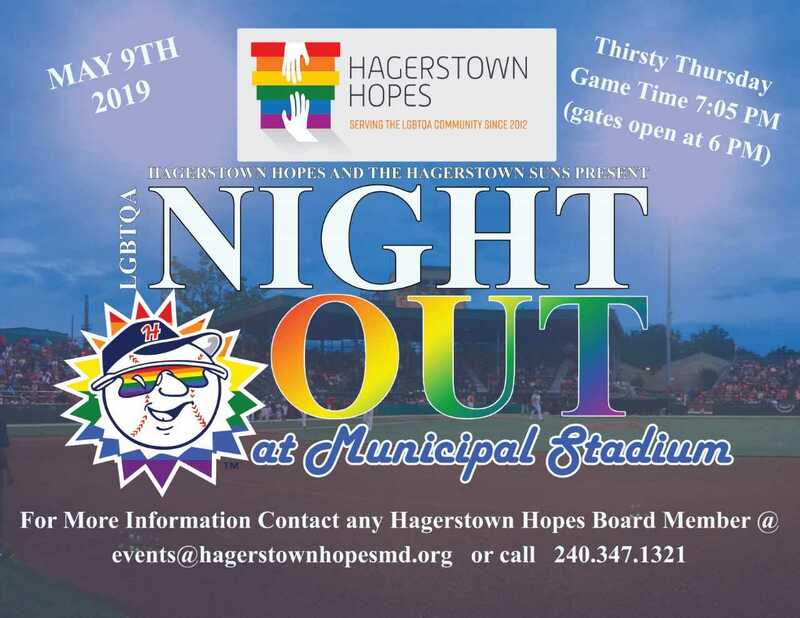 Hagerstown Hopes and the Hagerstown Suns have partnered for the first ever Pride Night Out at Municipal Stadium. This is the first event of this type in Washington County and Hagerstown area, and is a huge step in the partnership with the community! Please come out and support both organizations in this endeavor! Hagerstown Hopes benefits from every ticket purchased through Hagerstown Hopes. You MUST buy your ticket from a Hagerstown Hopes member to support this event and Hagerstown Hopes. We can only accept cash payments for the tickets, which are only $9!!!!!! This event is held on a Thursday, and that means it is Thirsty Thursday night at the stadium with beer specials starting at just $2!!!!! Join us for this new, exciting and fun event! Let’s cheer on the Hagerstown Suns, and PLAY BALL!!!! Please contact a member of Hagerstown Hopes to purchase your tickets, or email us at events@hagerstownhopemd.org to set up a way to purchase tickets!